I am back home and look back on a terrific EC. I did not do as good as I hoped, but 9th in 8-ball, 17th in Straight pool and 9-ball is not so bad after all. 10-ball I ended on 25th, not to happy with that. The closing ceremony was great, we had an awesome live band and good food. It was a good ending of a good championship. In the mens division there was 16 different people taking medals ogf 16 possible. The standard of play is getting very high. Live broadcast on Eurosport was also something new and exciting. I hope this will go even further and allow the womens final to be shown aswell. Next year in Luxembourg maybe? Good luck to Line, Monica, Jasmin, Ina and Marika in the Phillipine open! I am happy I will stay at home for a while:) Next tournament is in a few weeks here in Stavanger. 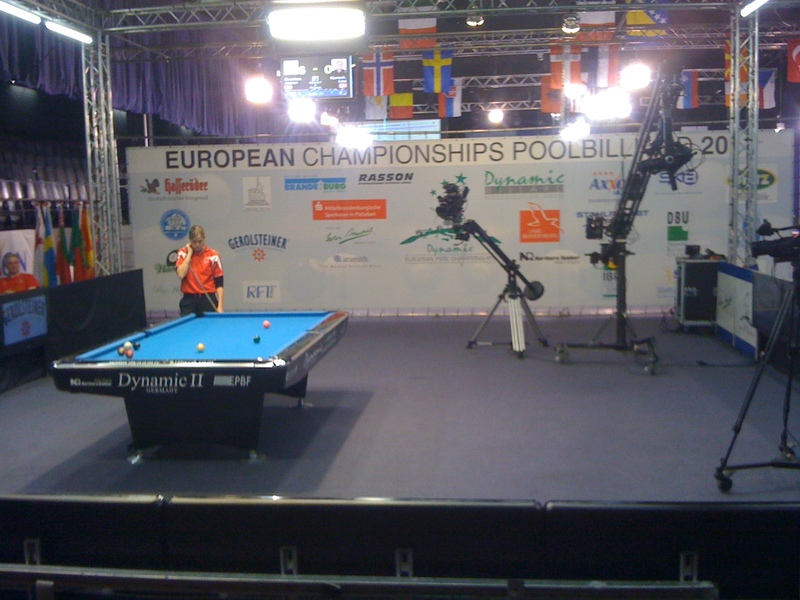 Line Kjørsvik playing against Jasmin Ouschan in the semifinals 9-ball. You can see the setup for the cameras.